While it’s increasingly common to get overwhelmed in the ocean of emails, the Mail app in iOS includes a really great feature to help you quickly navigate between and scan through tons of emails very quickly. The navigation feature is prominent in the Mail app, and though many users will know about this already, it seems to be vastly underused and often outright unknown by plenty of other iPhone owners. It’s too useful to not point out, so we’re going to show you the quickest possible way to move between emails on the iPhone Mail app. As mentioned, navigation is a very prominent feature in Mail app: it’s those little arrow icons in the corner of an open email message on your iPhone screen. Super easy and very fast, right? This basically prevents you from having to go back to the original inbox and then tapping onto a new message. Instead, the next (or prior) message just loads instantly on screen. You can use this to quickly scan through tons of emails on an iPhone using the navigation buttons, each email that is opened for a moment is then marked as read, which can really help cut down on email overload if you want to actually review stuff rather than just calling it quits and marking everything as read. With something so easy and with the buttons basically right in front of everyones face when an email message is open on an iPhone, it makes you wonder why this is not well known. Perhaps the arrows are too subtle looking, because after showing this to a friend recently (who was annoyed with tapping back to the Mail inbox and then tapping on a new email repeatedly), they said they had never even noticed the little arrow icons in the Mail screen. Even when a user has the Show Button Shapes feature enabled in iOS to make tap targets more noticeable, the arrow icons aren’t highlighted or obviously indicated as a button. Another potential point of confusion is that users coming from the Gmail for iPhone app have a very similar arrow button in the corner of an email message, except that in Gmail app it summons a pulldown menu of additional mail options and isn’t used for navigation at all. So whether it’s just overlooking the feature, or confusion on what it does, it’s probably less used than it should be. At the very least, you should know it exists and that works remarkably well to skim through tons of emails on the iOS Mail app. 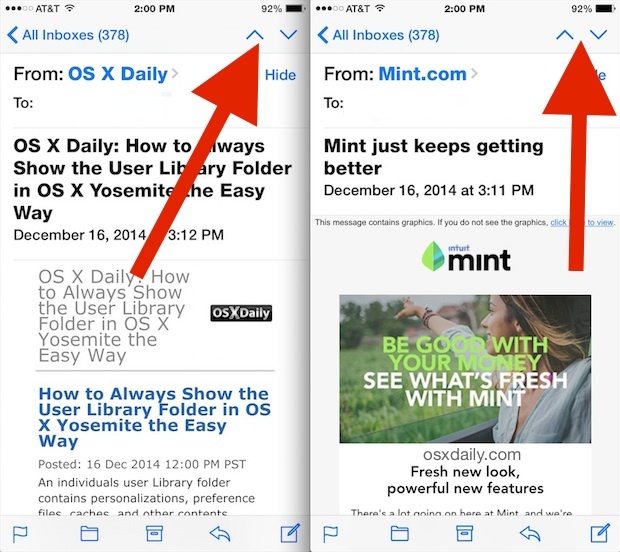 To be clear, this speedy email navigation trick is not limited to the iPhone, it’s just likely to be most useful in the single-pane Mail app view of iPhone and iPod touch. The larger screen and dual pane Mail screens on iPad and iPhone Plus will still have the next / previous buttons, however. This is a feature that the Mac Mail app could use as well, but in the meantime if you’re on a computer, you’ll have to rely on shortcuts using the keyboard to navigate between OS X Mail messages. I didn’t use this until I had an iPhone 6 Plus, and yea, I just think I overlooked it for years. Been using iPhone since the plastic GS model, and I’m pretty sure it’s been there the entire time. Hmm. Really , LOL , so basic and obvious with the article beiig so drawn out. I think that is the point. It’s easy, so use it. Either you or Apple have the arrows reversed, and I think it might be you. The down arrow goes to next and the up arrow goes to previous. i have been using iPhone for many years. Did not know of this feature. Very useful. Thanks. Email stays on the laptop. Email on a phone makes no sense at all. I agree, I scan through basic emails on the iphone, but anything important gets a proper response from a computer. I don’t get the people who try to do everything in the world on their iPhone or iPad. What a pain. The iPhone is very much a gadget and consumer oriented thingymajig to see this and that, play this or that, distract the kids sometimes, sure it makes phone calls and text messages, takes some pictures, but it is not like the invention of the lightbulb or anything (and the same applies to Android, don’t get me wrong). Many mail annoyances created when Apple over-simplified the app, disappeared for me when I switched to AltaMail. I tried to love Apple’s Mail. I feel AltaMail the only professional email app running on iOS. I have noticed this feature but choose not to use it because I cant see the next email to be opened. For a while there were a ton of emails that if you opened them it would email your whole contacts list somthing like… Hi im the prince of Iran and I have a huge amount of money but need somone to kindly help me transfer it to the US. When using the arrows to scroll thru your emails, it automatically opens an emai. You may not want to open an email from someone you do not know because it may have a virus.